Sixth have read a novel called Under the Hawthorn Tree, fifth are currently reading it. This book takes place in around the 19th century. It is about Peggy, Michel and Eily three siblings trying to cross from one side of Ireland to another in the time of the famine. So both sixth and fifth were treated to a surprise tour to the Ulster American Folk Park. The Ulster American Folk Park is in Tyrone so the bus journey to there was quite a long one ( around two hours and forty five minutes ). When we ( Fifth and Sixth ) got there we were all exhausted from the long trip ( even though all we did for the last two hours was sit and talk). After sorting out fifth and sixth into separate groups (and lots of bathroom trips!) we all were ready to enter the park. Inside the park we ( sixth ) came to a small cottage, which could barely fit all of us inside it. The cottage was meant to replicate what standard cottages around the time of the famine would have looked like. Inside was a old lady dressed up as they would have been in the 19th century. She informed us about the regular meal at that time. Next was the school house. 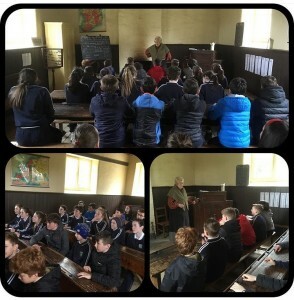 The school house was just one large room the size of a normal classroom. It was filled with large benches with tables attached to them. A lady dressed like a teacher of that time told us what school life was like in the 19th century. She informed us that every child was expected to bring a lump of turf for the fire in the school. After that we headed towards an other small cottage this cottage was different from the others due to the fact that this cottage contained two rooms. The lady inside this house told us about the soup kitchens set up at the time for the many people that were starving because of the famine. She let us all sample what some of the soup back then would have tasted like. The soup was delicious. After we all tried some soup we were heading towards another cottage when a lady jumped out at us. She like the others was dressed as people would have been at the time of the famine. She acted out the part of one of the characters from under the Hawthorne Tree. She was a very convincing actor. When we reached the next cottage we could see geese, chickens and ducks walking around freely. Fifth were already in the cottage so we had to wait till they were finished. Inside was yet again an other lady. 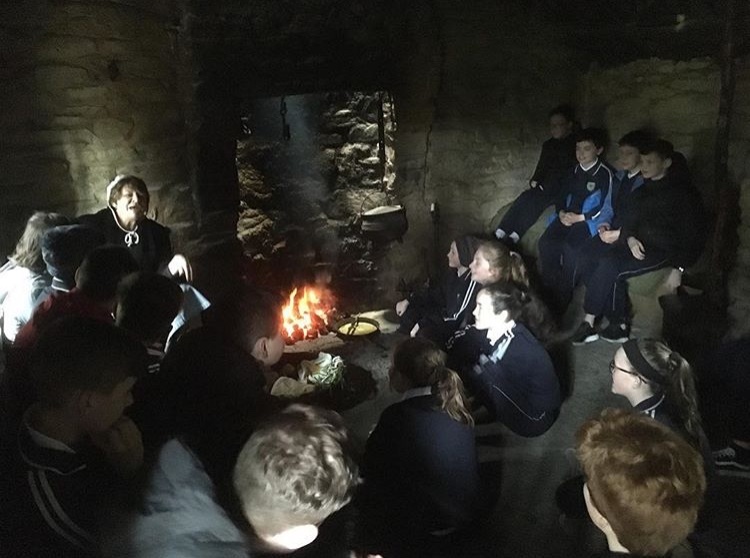 She told us the story of a boy who use to live in Ireland but then moved to America and later on in his life became man who made millions. And as we were leaving she gave us all a small bit of what a pancake of that time would have tasted like. And just like the soup it was delicious. After our lovely pancake sampling we headed to another cottage (though we almost got a bit lost trying to find it). Inside was a lady who told us all about the medicines of that time. She told us simple things like onions, winds (a yellow type of bushy plant) and weeds could be used for medicinal purposes. We were still in surprise from the little robbery when we came to an old American shop. It was filled with weird and strange things which would have been totally common in the 19th century. Inside another dressed up lady told us about the common resources in America at the time. Next was a large American farm house. This house was different to all the others since this house was a two storey. The lady inside this house told us a little bit more about America and what is was like there. The next and last cottage had two rooms. (Most of us found it hard to concentrate on what the lady was saying because we were way too distracted by the deceased ducks hanging from the ceiling in the second room.) After all of our wandering we finally had visited all the cottages so it was sadly time to head home. But not before we visited the gift shop. All of 6th and 5th got to bring a maximum of five pounds and we were allowed to spend it on a memorable souvenir. I think we spent more time in the gift shop then we did in any of the cottages. When we finally finished with the gift shop we collected our bags and went back to our buses. We all had an amazing time.